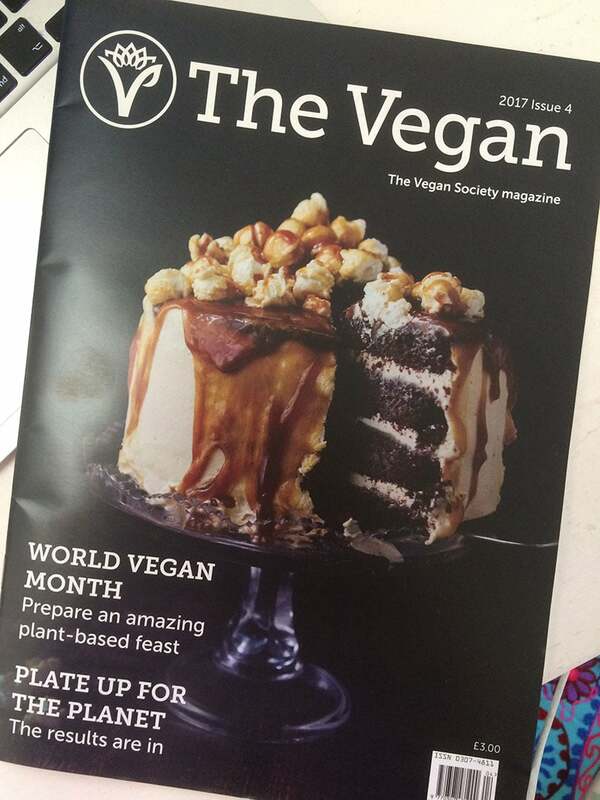 Recently I had the very exciting opportunity to work with The Vegan Society, creating a cake recipe to start on the front cover of their magazine! 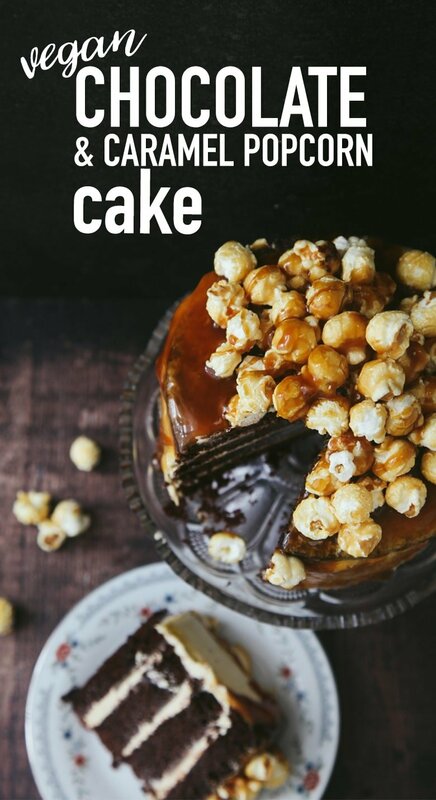 As you may know, it’s World Vegan Month so to celebrate, they were looking for a drool-worthy cake made with ordinary ingredients you can find in a supermarket. 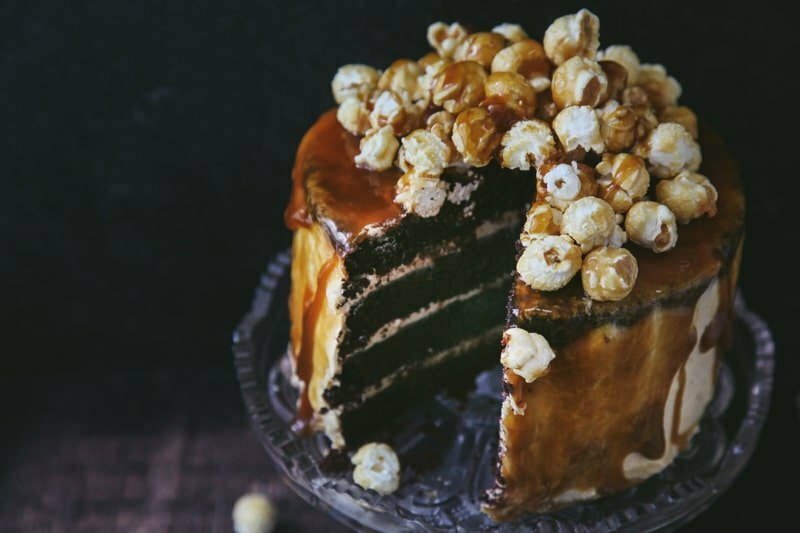 I couldn’t decide between chocolate and caramel so I combined the two with the addition of popcorn for decoration. The Vegan magazine is free to all Vegan Society members and membership starts at just £2 month! You also get discounts in health food stores (including Holland & Barrett) so it’s definitely worthwhile. You can find out more by clicking here. It was such an honour to have a recipe on their front cover and I’ve included a few extra recipes inside the magazine too. So if you’re a member, you might have already received the magazine in the mail – let me know if you try any of my recipes featured! But now onto the recipe. Admittedly, there are a few components to this cake so it is a bit time-consuming. But SO worth it. I swear. And no, it is not healthy in the slightest. This is a special occasion cake that is filled with sugar and other “naughtiness” but it’s always a pleasure to indulge in something ridiculously decadent every now and then! 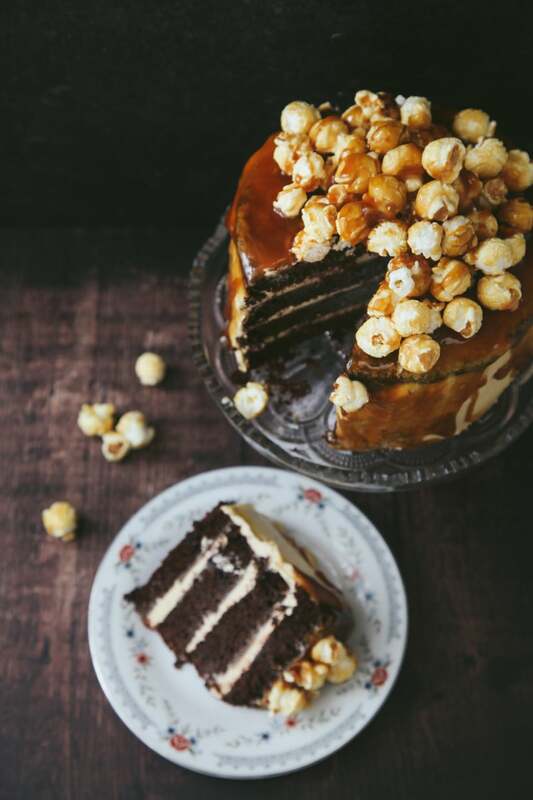 The cake is a chocolate sponge made in four layers, sandwiched and frosted with caramel-infused buttercream. 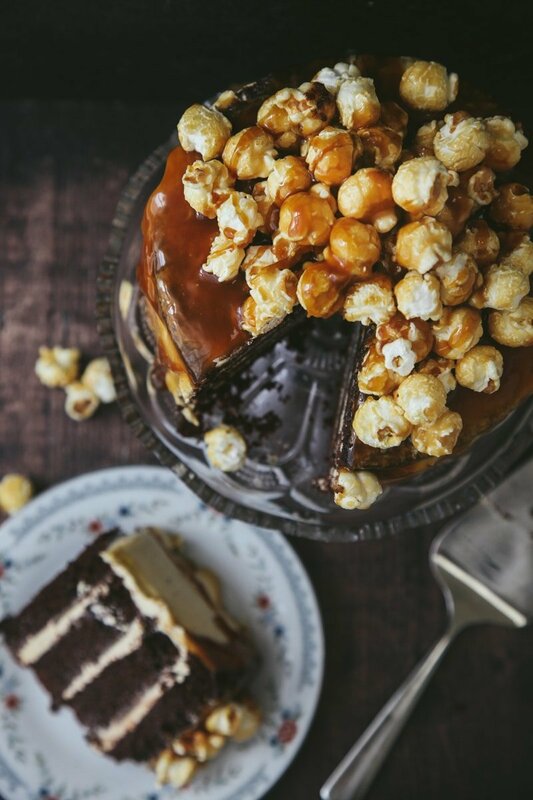 Drizzled with extra caramel and decorated with toffee popcorn. It’s unbelievably delicious. An incredibly indulgent and delicious celebration cake, perfect for celebrations! You need to work quickly making this so have a prepared large flat baking tray ready to set the popcorn and all the ingredients to hand. Add the sugar and water to a large pot on a medium-low heat. Don't stir but you can shake to stop it burning. Once the sugar turns a deep caramel colour, remove from the heat and add the tablespoon of dairy-free butter. It will bubble up, keep stirring until smooth. Then pour over the bowl of popped corn. Quickly transfer to the tray to set. Preheat the oven to 180C / 350F and grease and line two 8-inch cake tins. Mix all the dry ingredients into a large bowl, then whisk in the wet ingredients, leaving the apple cider vinegar til the last minute, as it will react with the rising agents to help make the cake fluffy and risen. Pour the batter equally between the two cake tins and bake for approximately 35 minutes or until a toothpick poked into the middle of the cake comes out clean. Once baked, leave to cool completely before removing from the tins. Then freeze the two layers for a few hours, so it's easier to trim. Remove from the freezer and trim the tops to make them even. Now slice each layer in half, length-ways, to create four cake layers. Whisk the dairy-free butter in a large mixing bowl, adding the icing sugar a small bit at a time. Then whisk in the caramel sauce, working whilst the sauce is still warm and at a pourable consistency to stop it from hardening. Let the buttercream chill in the fridge for at least a couple of hours before using. Add buttercream to the top of the first cake layer and sandwich together with the next layer, repeating and covering all layers with a generous dollop of the buttercream. Then frost the outside of the cake, starting with a thin crumb layer before adding a more generous coating. When the caramel sauce has cooled but is still a thick, pourable consistency, pour over the top of the cake, letting it run down the sides. 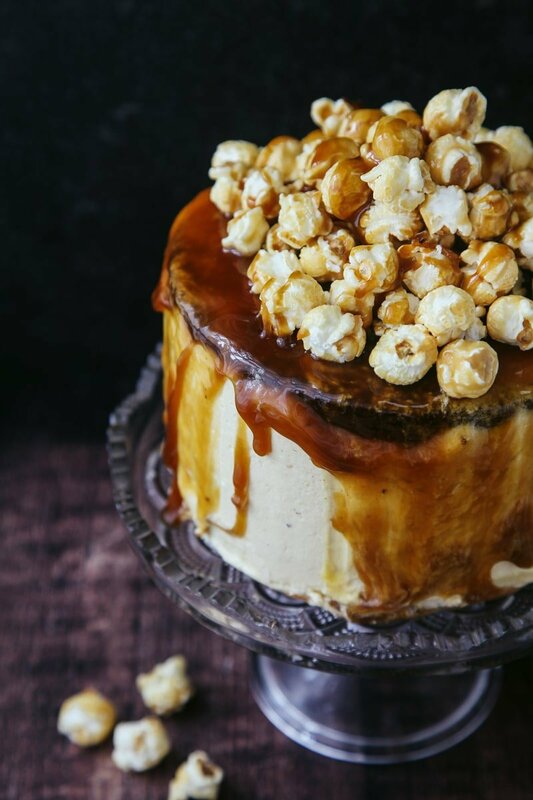 Pile the popcorn on top and pour more caramel over to keep it in place. Leave in the fridge for a few hours to set and keep fresh, before serving. I made this for a friend’s birthday. It came out beautifully and was a true stunner. The only modification I made was to make another half batch of the frosting so I could really fill my layers, crumb coat, and cover. This was likely because I only had 9 inch pans so it made the cake a bit wider instead of tall. I used Miyoko’s vegan butter and it worked beautifully. The vegan butter itself is a bit salty, so if you use this one don’t add extra salt, but the salt really helps cut through all that sweet and makes a wonderful finished product. I used full-fat coconut milk for all of the non-dairy milk parts. It has a richer taste than almond or soy, so helps give the right mouthfeel. Really delicious, easy to make, and was GONE in about 20 minutes. Leftover hack: I’ve been putting a spoonful of leftover caramel in my coffee in the morning... soooooooo good. Also good on sliced apples. 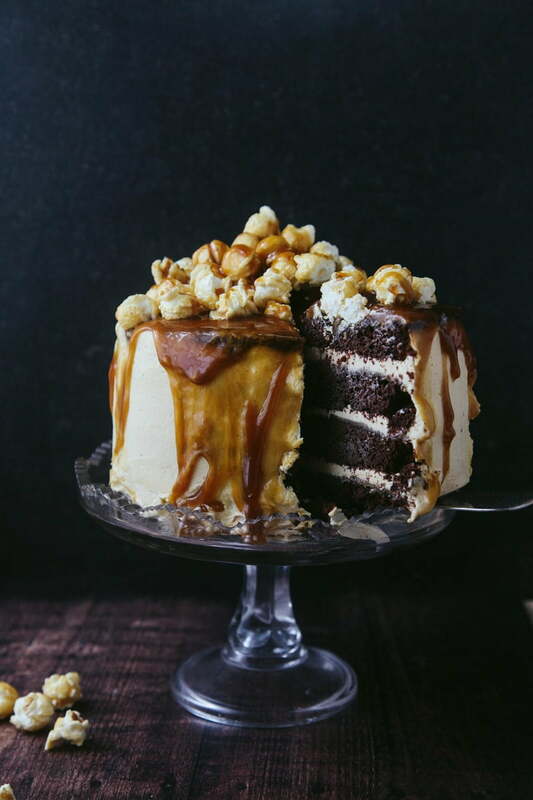 Hi, I want to make this cake for my husband's birthday next week, but I can't find the recipe for the caramel sauce. 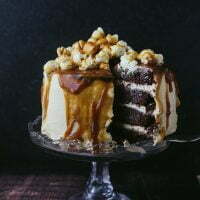 The 5 minute vegan caramel sauce under ingredients isn't hyperlinked, and this cake is the only thing that comes up when I search for the recipe. Did you remove it? Thanks in advance. Friend and I made it for our house Christmas meal yesterday and whoa did it taste good (looked a very artistic mess though, nothing like yours!). All of our housemates were very appreciative, and whilst it is fiddly, it's less fiddly than I thought it would be? We also drizzled leftover melted chocolate over the top of the buttercream too. Thank you for writing it! Can you clarify how much of the caramel goes into the frosting please? Is it one third of the double batch, or a third of a single batch? Sorry, so confused! The recipe description and how everything actually went in reality left me very disappointed * The 5 min caramel is more like 30 min caramel * Vitalite butter that is recommended doesn’t work in the buttercream recipe * The buttercream curdled (because that vegan spread doesn’t have high enough fat content) * When you pour the caramel sauce into the buttercream (while it’s warm) it makes the buttercream runny and not possible to work with * Then the buttercream doesn’t hold up inside the cake or around it * Then you’re supposed pour over some cooled (still warm somewhat so it’s pourable) caramel sauce on top which further melts and slides off already runny buttercream hence no buttercream left on the sides I feel like the recipe is lacking proper instructions and I don’t believe it was made using Vitalite butter that was recommended. I would not be so cross if this was my experiment which didn’t work, but I followed a recipe to a T.
Hi, Is this cake quite heavy and fudgy once baked or should it be light and fluffy??? Hi there, thank you for this great cake. I've got a question: is this cake meant to be quite dense, a bit rubbery and quite heavy rsther than light and fluffy??? Hi Maria I would say somewhere in between. Not too dense or heavy but not really light either. The frosting and caramel does make it quite rich though. Hope that helps! This is the most incredible cake! I’m going to try making this for my little cousins 1st birthday and I have a question - do you need a double batch + 1/3 of the caramel sauce or do tou mean 1/3 of the double batch? Thank you for this recipe it will be a hit! Wow! What an incredible vegan cake! PErfect for special occasions. Hi there! First visit and comment to your blog. LOVE your site here! Mind if I link you on my sidebar!? Swing by my place and let me know - it would make my day! Cheers! Looks soooo delicious Aimee. And so gorgeous on the cover, congratulations! I would've been super surprised if this dream cake would've been a "healthy cake" haha. Sometimes we all just need the real stuff :) Have a lovely day!